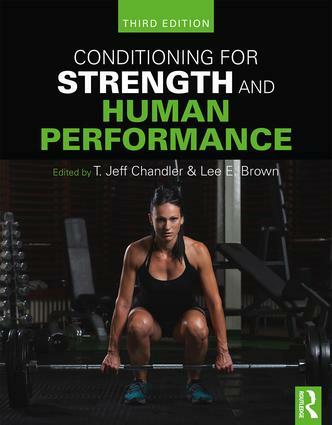 Fully revised and updated, the third edition of Conditioning for Strength and Human Performance provides strength and conditioning students with the clearest and most accessible introduction to the scientific principles underpinning the discipline. Covering bioenergetics and nutrition, a systematic approach to physiological and endocrinological adaptations to training and the biomechanics of resistance training, no other book provides such a thorough grounding in the science of strength and conditioning or better prepares students for evidence-based practice. T. Jeff Chandler, CSCS, NSCA-CPT, FACSM, FNSCA, has previously served as Professor and Department Chair at Marshall University, USA, and as Professor and Department Head at Jacksonville State University, USA. Dr. Chandler has 12 years of experience in a clinical sports medicine setting at the Lexington Clinic Sports Medicine Center, USA. He is the Editor in Chief of the Strength and Conditioning Journal, the professional journal of the National Strength and Conditioning Association, serving in that position since 1998. Lee E. Brown, EdD, CSCS*D, FNSCA, FACSM, was on the faculty at California State University, Fullerton, USA, from 2002–2017 and was the Director of the Center for Sport Performance and the Human Performance Laboratory. He was President of the National Strength and Conditioning Association (NSCA), the NSCA Foundation, and the Southwest American College of Sports Medicine (SWACSM). He also sat on the Board of Trustees of the national American College of Sports Medicine (ACSM) and is a Fellow of both the ACSM and the NSCA.